It’s another month in the Cottage Cooking Club, a project led by Andrea, The Kitchen Lioness, that is a combined effort of several bloggers to cook all the recipes in Hugh Fearnley-Whittingstall’s cookbook, River Cottage Veg. This vegetarian cookbook contains a variety of recipes ranging from the simple to the complicated, all meant to encourage your palate and your kitchen to embrace more vegetables in your daily life. Andrea’s sensibilities follow the season, so when she chooses the recipes each month, she tries match up to what’s growing in the typical Northern clime. April is a hard month for local produce in my neck of the woods. Happily, winter has departed, but it’s still early in the season. In my home garden, early herbs (chives and tarragon) are thriving. The radish, arugula and pea seeds we planted have germinated, but it will be weeks before anything is ready for harvest. The local farms are in the same boat. I volunteer weekly at the local community farm and the past month I’ve been in the greenhouse, transplanting seedlings from tiny to larger cell packs. The farmer just planted the first seeds and seedlings in the ground the past weekend. With no hope of local vegetables, I limited my selections for this month to recipes that use vegetables that I typically buy at the supermarket all year round: celery and mushrooms. First up was a Celery Gratin. This was a much different presentation of celery than I’ve seen. Usually, celery is just a bit player in the sautéed aromatics for a dish or chopped into a stock. Usually the only time celery plays a starring role is cut up as a crudité for dipping or snacking. 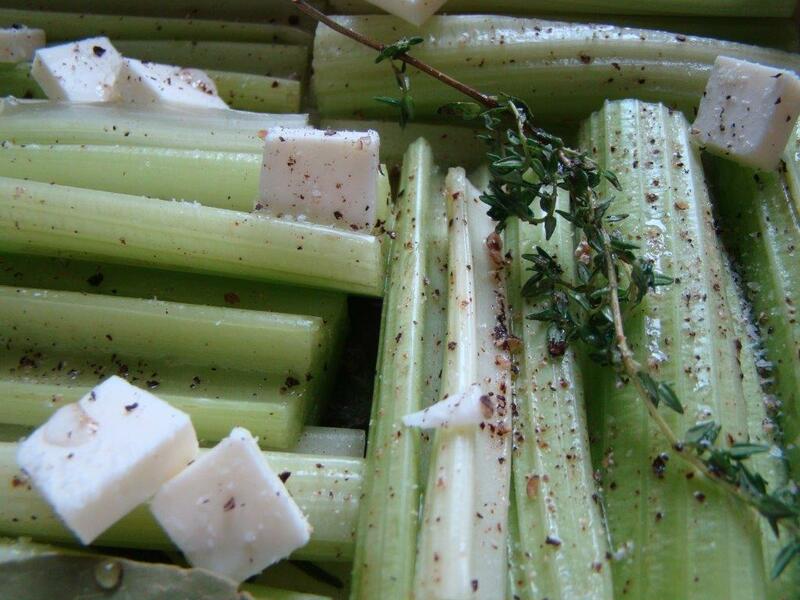 For the gratin, the celery is roasted with herbs and butter until tender, then topped with breadcrumbs and cheese. It was a beautiful looking dish, but to be honest, this is my least favorite recipe I’ve tried from the book so far. The celery, while tender, still required a knife to cut through the strings. Also, it was bland. It didn’t even taste all that celery-y. We finished it, but were not fans. 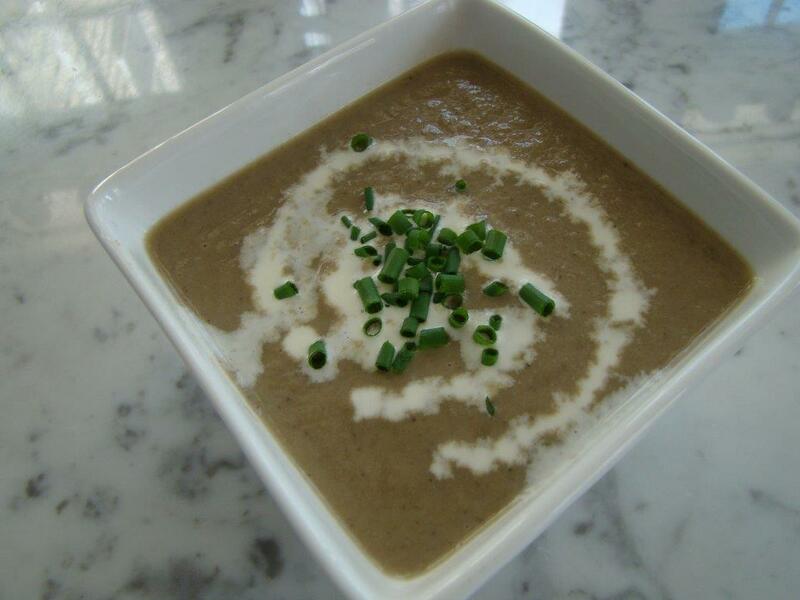 On the other hand, the Creamy Mushroom Soup is one of the best mushroom soup recipes I’ve ever made. 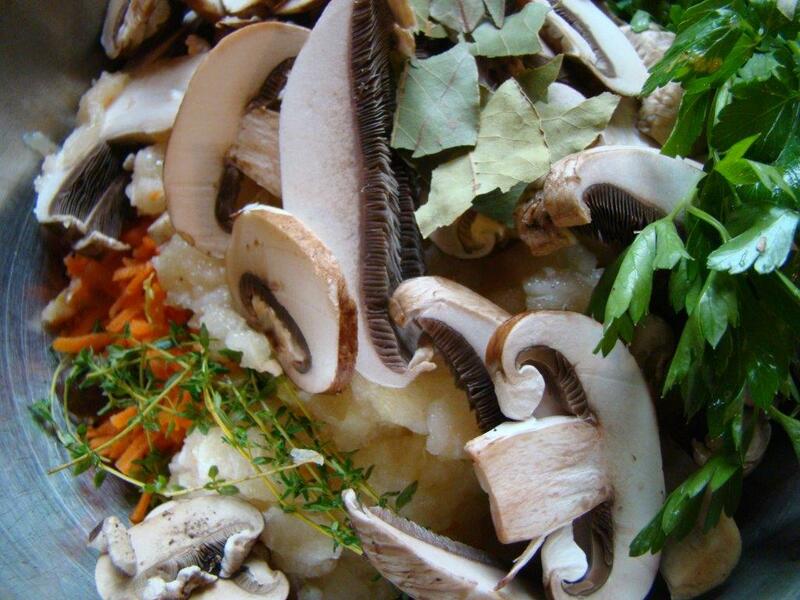 Leeks and a variety of mushrooms (shiitake, cremini, and Portobello) are sautéed and then simmered in homemade Vegetable Stock with a sprig of thyme. This fragrant soup is then pureed in the blender. To round out the flavors, some heavy cream, sherry, and nutmeg are added, giving the soup deeper flavor without making it too heavy. I was excited to garnish the soup with snipped chives from my backyard herb garden (yay, spring is here). The only change I might make next time is to add additional dried thyme when sauteeing the vegetables for a more pronounced herbal tone (and thyme is my favorite herb). The mushroom soup is definitely a winner! 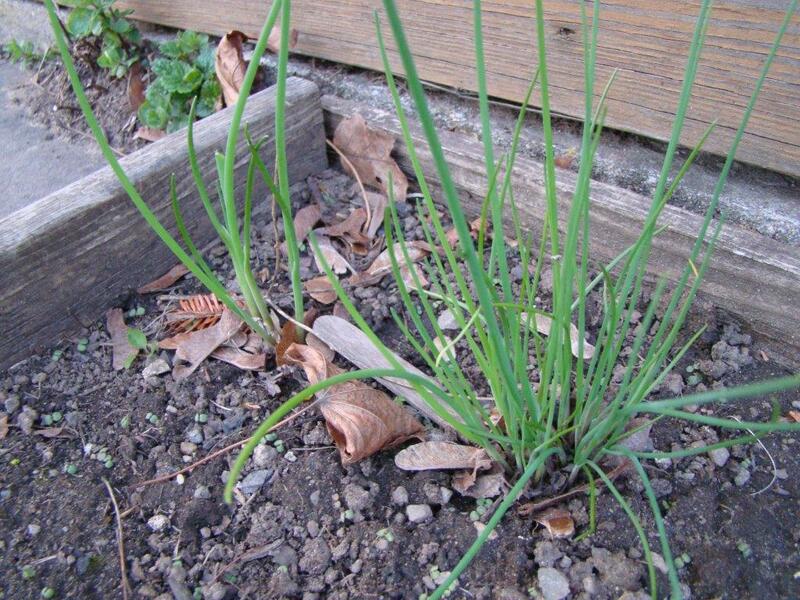 Chives in My Herb Garden! If you’d like to check out the recipe reviews for April from the other Cottage Cooking Club participants, check out their links here. I think the anticipation of making this week’s recipe for French Fridays with Dorie, Sardines Escabeche, was one of the most-dreaded in the book. 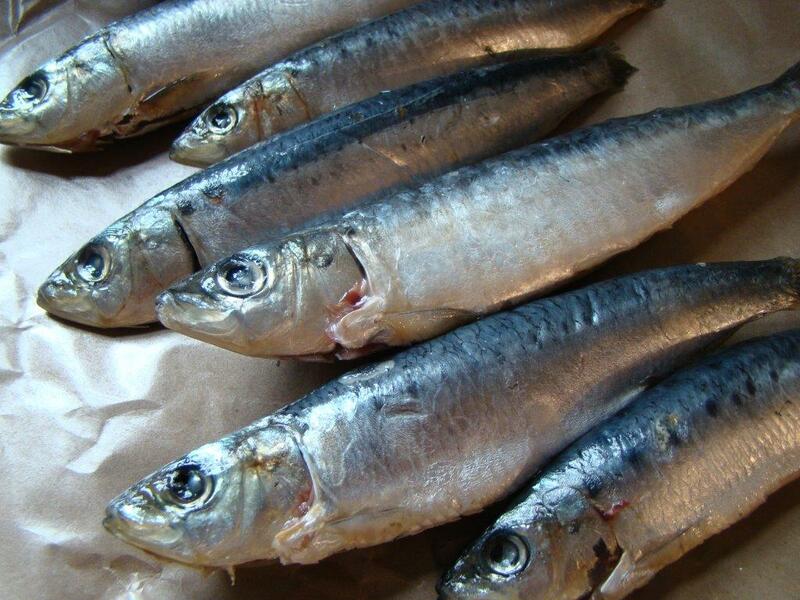 While I sympathize with others’ trepidation, I wasn’t bothered by it, because I like fish, even oily fish, and even sardines, In fact, I had a little trouble finding fresh sardines this week and was disappointed to think I wouldn’t get to try it. The stars aligned and I found sardines at the largest Whole Foods in my area. And, I remembered to ask for them to be cleaned. Last time I bought fresh sardines, I didn’t realize they were whole, guts and all, so had to quickly teach myself to clean them out. Yuck… I hadn’t read the recipe through and didn’t realize they needed to be filleted, so this time around, I learned how to fillet sardines, courtesy of Jamie Oliver. It wasn’t too bad. I’ll take filleting over cleaning any day! I couldn’t quite imagine what this dish was going to be like as I put it together. 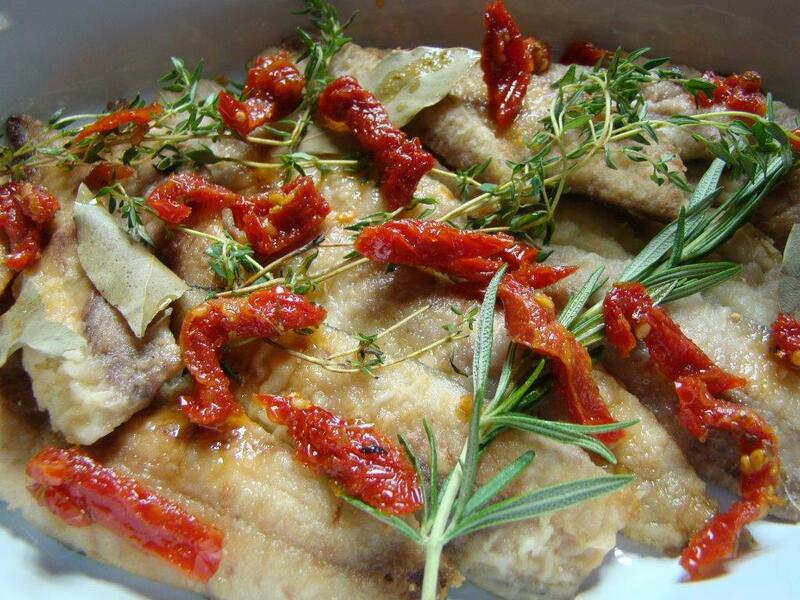 The sardine fillets are quickly fried to partially cook them, arranged in a dish, and strewn with thyme, rosemary, bay leaves, and sun-dried tomatoes. Then thinly sliced vegetables (onions, carrots, celery, and garlic) are sautéed and then simmered in olive oil, vinegar and spices (and a little bit of ketchup). The hot vegetable mixture is poured over the fish and chilled overnight. We ate the sardines escabeche with crusty bread for dipping in the flavorful oil and a beet walnut salad on the side — a picnic of sorts. There was a reverse verdict on this one. Howard really enjoyed it. For me, the fish was just too fishy. 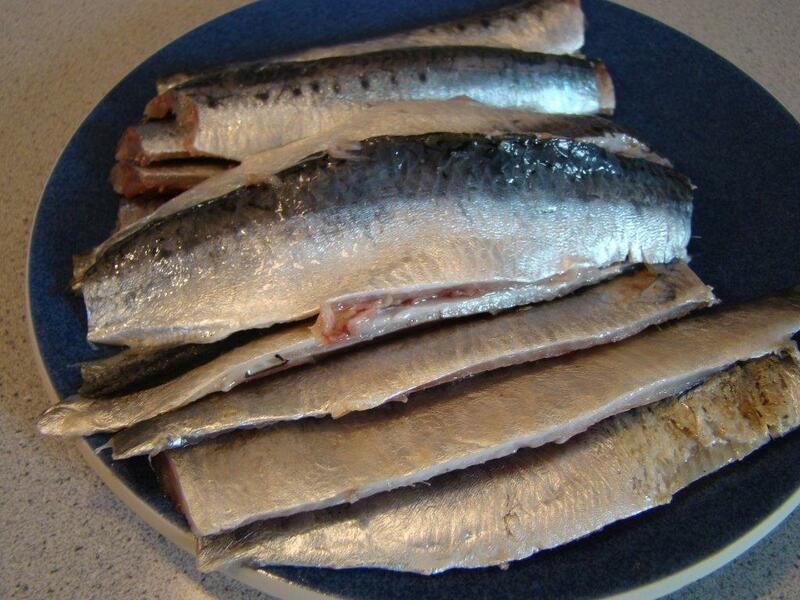 It reminded me of pickled herring, which is one of the few fish preparations that I don’t really care for. On the other hand, I loved the oily pickled vegetables. While I doubt I would make this with sardines, I would make the vegetables, or maybe even the bonne idée, using shrimp instead. 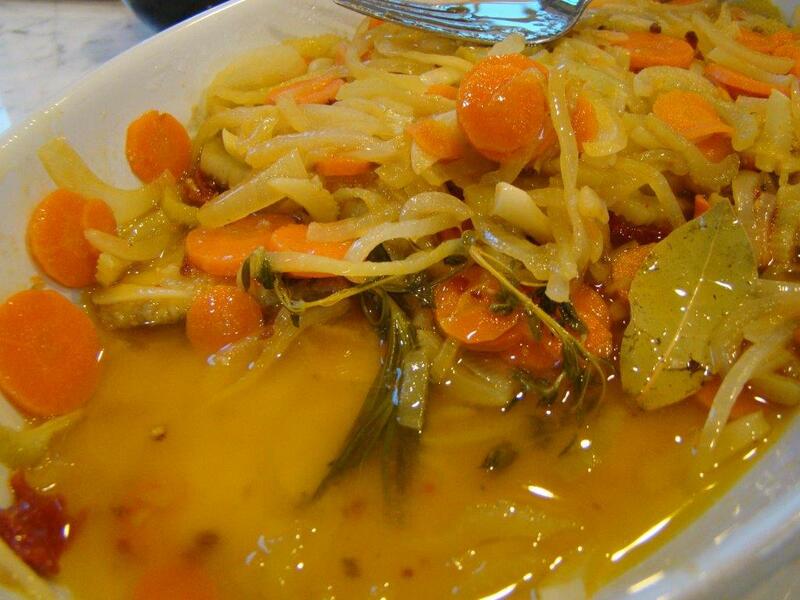 To see how the other Doristas made out with their escabeche, check out their links here. You can find the recipe in Dorie Greenspan’s book Around My French Table or this similar one on Dorie’s website.